Further to Saturday’s half-marathon ‘I do’. 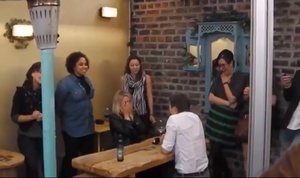 My lovely friends – Ronan and Sarah – got engaged on Friday night following a flashmob proposal organised by Ronan. It happened in Solas on Wexford Street [Dublin] and he was assisted by The Line-Up Choir. I think it’s a nice feel good movie for those suffering on All Ireland Monday. Should Have Put A Ring On It So You Saw The UCLA Jumbo-Vision Marriage Proposal Fail? Animation: The Wedding Is This You? 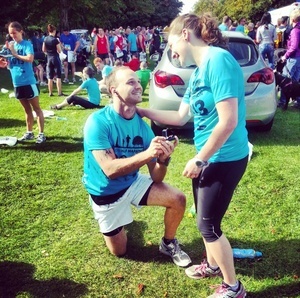 Posted in Misc and tagged marriage, proposal at 9:58 am on September 23, 2013 by Broadsheet.